Time to begin the exciting process of coming up with our game concept, this is always my most favourite part, where we get to throw down all of our wacky ideas into a cauldron. Me and Amber usually approach the ideation process by starting with a combined pool of ideas, then going away and building off those in our own time. Then we come back to share them with each other again to compare and contrast our ideas and pick the best ones. Basic idea generation, recording anything that remotely interests us. Slowly a concept began to form. As expected, the ideas that emerged were mostly story-based but each of our ideas fit quite well with each other. 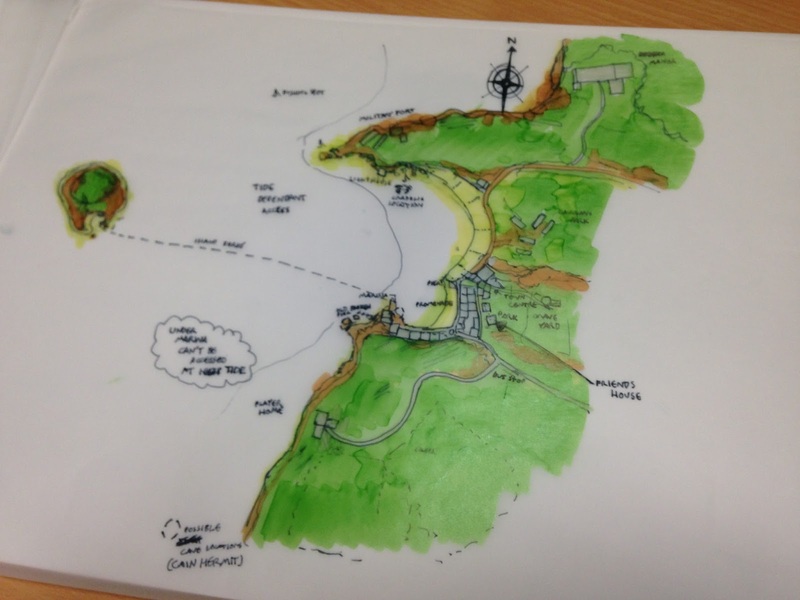 A base concept set in a seaside town filled with mystery and conspiracy started to take shape. All sorts of concepts were explored, including gameplay focused around getting a pet dog to find clues and retrieve items as well as the idea of getting the main character to shut out outside sensory input and retreat into a bubble. As more work is put into the core game design over the next few weeks I will begin to post more details of the narrative. I have always been fascinated in worlds which feature large amounts of detail, character and depth; that have their own sets of rules that everything abides by to create a truly immersive fictional setting. This is something which I always strive to push in my personal projects as I try to think from the largest themes to the smallest details, making sure everything is completely fleshed out. Even in a world that remains largely un-fantastical world-building can help in grounding a setting as well as giving writers a playground to use and create really interesting stories within, by using an established lore. For this project as the ideas began to develop a lot of similarities became apparent to a long standing hobby project of mine called 'A World Below'. The seaside town setting combined with a deep and mysterious plot involving occasional moments of fantasy and conspiracy is something which A World Below is centred around, and it seemed to make a lot of sense to set this new game within the same world and possibly even the same seaside town. 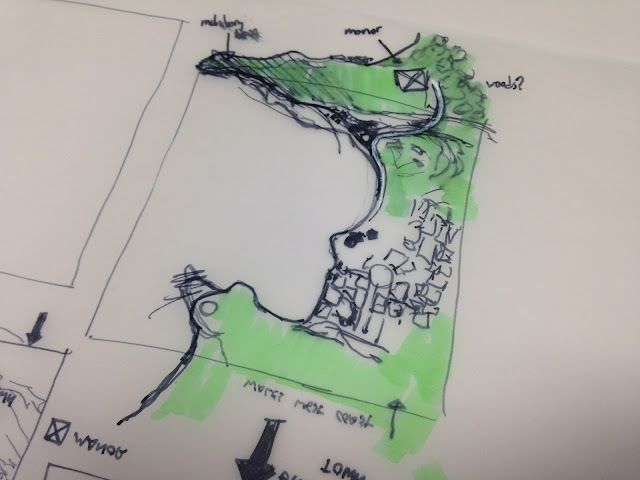 However using A World Below presents quite a few challenges from a design perspective. The consideration is that the world would have to be designed more with an overall picture in mind; the top-down approach, this will lead to headaches though as the world would be have to be created with this game in mind along with any games set in the same space. The other approach is the bottom to top approach in which the plot is created and everything including the world comes from that. This method has its merits too in that the location will reflect the drama of the characters a bit more but this has the possibility of leading to potential plot holes, inconsistencies in the world between parts of the same game or between different games in the same universe. Create broad strokes world and story together, keeping in mind areas which might not be immediately accessible. Build up/alter lore to make it fit better with story. Refine gameplay and level gating to story details as they are refined, fleshing out world details. 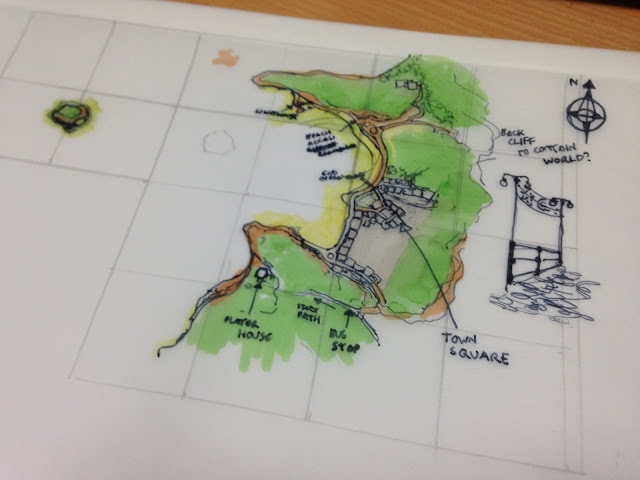 Below are a load of photos of some of the development sketches over the last couple of weeks and some of the processes we have been through, there is still a lot of work to do with refining the overall concept but here you an start to see the creation and iteration of a town environment and a base narrative structure. We started with the weird approach of creating a basic world design that we can refine later as the story takes hold, this way we can use the world design to inspire new story elements. The layout sketches started from a satellite image of Aberystwyth which has become a heavy inspiration point for this project. 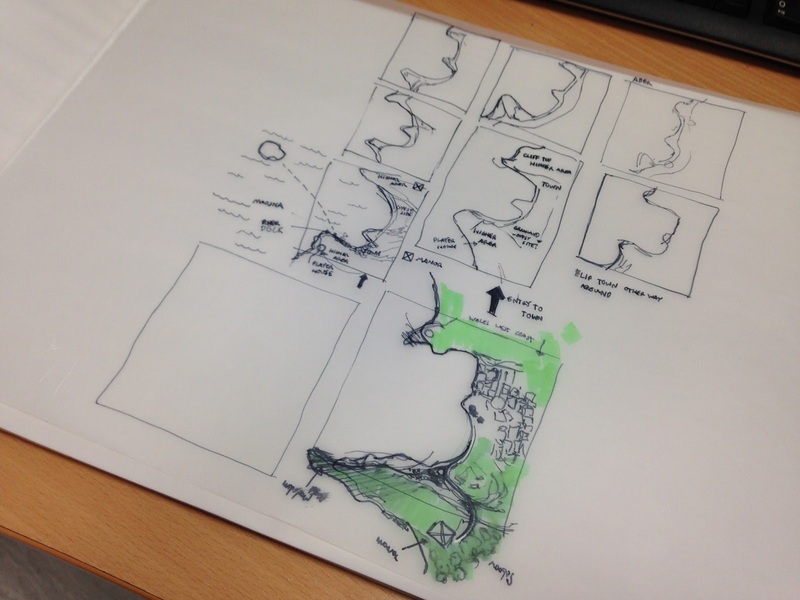 Because these sketches are on tracing paper I can easily overlay designs to iterate; I used this quality to flip the map layout and began sketching on the other side, the flipped layout lending itself better to our design. I created an iteration of the really small sketch, refining a little bit of the town layout, I then overlaid a grid so then I could create an enlarged version of this for further iteration. The enlarged version allowed for a better scale representation of the world and an opportunity to select places for landmarks as the story is built. In my sketchbook, I created a loose sketch of the town with a key to label potential places, a lot of this will probably get discarded in the final story and iteration of the world, but this is just to get down a rough draft of stuff we might want to include. 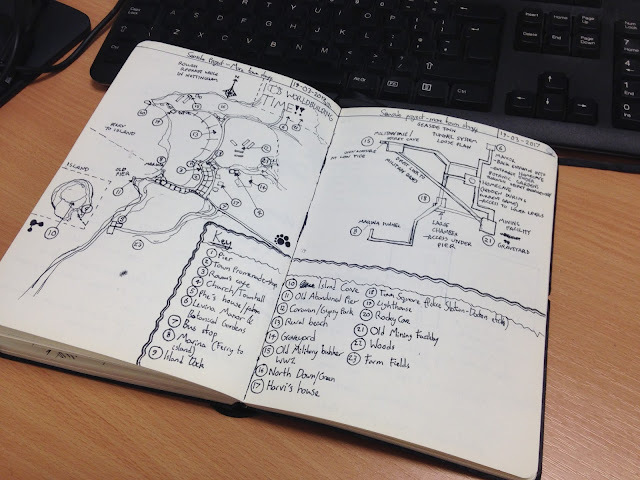 I also created a sketch of a potential network of underground tunnels which will feature as part of the story. 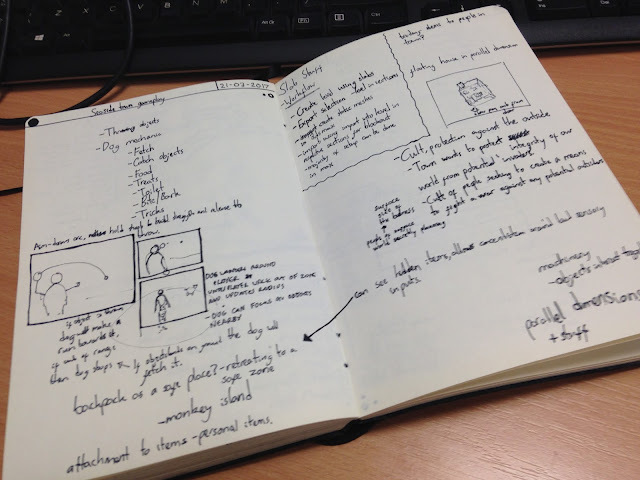 Below are sketches and ideas of gameplay ideas and verbs that the player can perform with the game: these are essentially actions the player can do within the game, access to these are gated through the game and this controls the game's pacing. Current state of our whiteboard: We had a whiteboard from before with all of our different ideas and we then created this layout from filtering them down and iterating upon our leftover concepts. 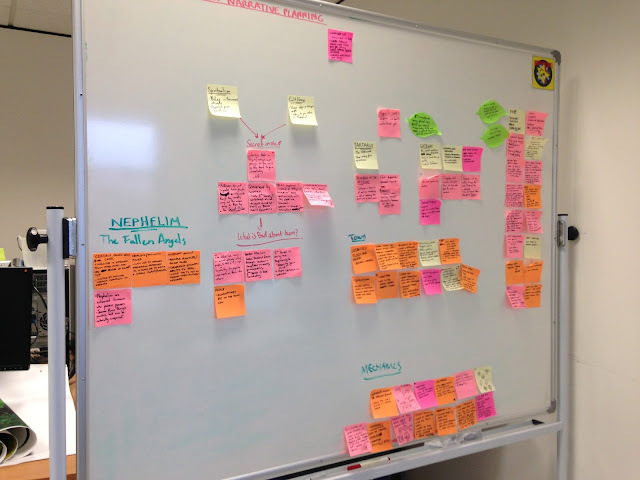 Here we have put sticky notes under certain headers, some of the ideas cross pollinating. As this becomes more solid we begin to record the key concepts in a high concept document which contains all the gameplay, world and story information as well as any art direction notes. Next week we should have the high concept nailed down, afterwards work will begin on fleshing out the overall narrative, which will inform the overall level design and mechanics of the game.